At age 9, former Kentucky Derby runner and $1.4 million earner Vyjack is back in training and pointing for a return to racing, reports the Daily Racing Form's Nicole Russo. The gelding did not race in 2018 and was retired and sent to the Kentucky farm where he was bred, Machmer Hall, with the idea of training Vyjack for a sport horse career. But the son of Into Mischief was doing so well, owner David Wilkenfeld decided to return him to the stable of Phil D'Amato last month, following a veterinary exam. Vyjack has eight victories, seven seconds and three thirds in 31 career starts. Four of those wins came in graded stakes. 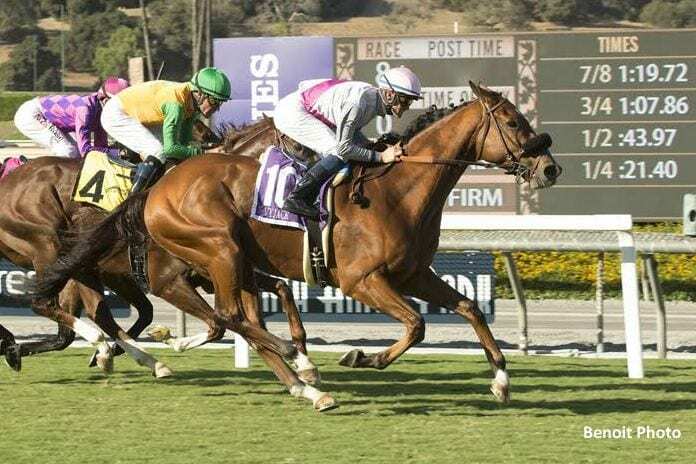 He finished second in his last three starts, the most recent being the Grade 2 Del Mar Handicap in August, 2017. Vyjack has recorded four workouts since returning to the track. This entry was posted in NL List, Racing and tagged david wilkenfeld, machmer hall, Phil D'Amato, Pick 6 racing, vyjack by Paulick Report Staff. Bookmark the permalink.